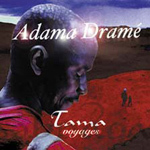 From djembe to songs, from tradition to the modern age... Adama Dramé, a modern griot, sings about his encounters, his travels and Africa, his continent. He is accompanied by 15 musicians. Stránka vygenerována 22.4.2019 v 23:02:07 za 0.19 sekund.